You may have been wondering why space scientists research into these sounds from space. Well check out the answer in this latest video in the SSFX series. The Space Sound Effects (SSFX) Short-Film Festival, presented by Queen Mary University of London (QMUL), has challenged independent filmmakers from around the world to create short-films incorporating a series of strange sounds from space recorded by satellites. The result is a collection of films, spanning a wide array of topics and genres, connected only by these sounds. The festival, on 2 September at Rich Mix in Shoreditch, will showcase these highly creative works, present awards for the best films and will hear from the filmmakers involved and festival judges in panel discussions featuring audience Q&A. Conventional wisdom usually states that space is a vacuum and therefore sound, which requires a medium to travel in, cannot exist. But space is not a true vacuum, it’s actually filled with very weak plasma, a different state of matter made of charged particles. While this plasma can’t support audible sound waves, it can support very quiet ultralow frequency plasma-equivalents of sound waves – magnetosonic waves. Dr Archer said: “These magnetosonic waves can bounce around within Earth’s magnetosphere, the magnetic shield which protects us from many sources of space radiation, and often set up ‘resonances’, where the frequency is just right so that these waves grow and grow in energy rather than fizzling out quickly. Scientists study these waves inside the magnetosphere because of their potential effects on our technology. The waves are constantly being monitored using satellite and ground observations. In the case of SSFX, eight years’ worth of measurements of these waves from the Geostationary Operational Environment Satellites (GOES) have been made audible. 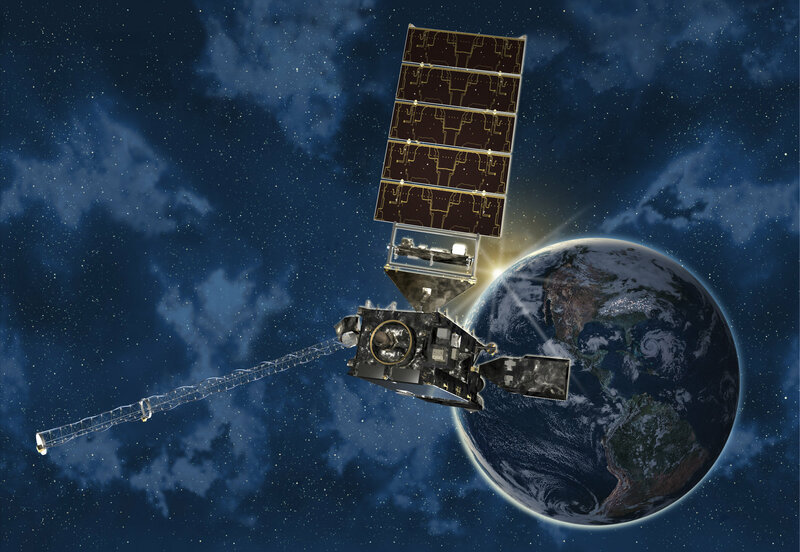 These satellites, operated by the USA’s National Oceanic and Atmospheric Administration, are principally used for weather forecasting, severe storm tracking, and meteorology research, but also monitor the space environment around the Earth through various instruments, including magnetometers (instruments which measure magnetic fields in space). By amplifying the magnetometer data and severely squashing it in time (so much so that a whole year becomes just six minutes) these ultralow frequency waves can be heard by the human ear for the first time. Dr Archer released this audio online, with filmmakers using it as inspiration in their works. A panel of judges, consisting of scientists and film industry figures, then reviewed all the films submitted to the competition and have selected the shorts to be screened at the festival. Nidhi Gupta, who submitted ‘Astroturf’, added: “We wanted to make a film that used the space sound effects in an interesting way, while telling a compelling short science-fiction story – and with no budget! The rustling, swirling space sounds reminded us of the noises that people make all the time when performing simple tasks – sounds that in film are often replaced or reproduced as foley. The SSFX competition has been supported by QMUL’s Centre for Public Engagement. Thanks to recent funding from the Science and Technology Facilities Council and the European Geosciences Union, the project will soon be expanding with the shorts being packaged together into an anthology film which will tour the country at festivals and independent cinema venues, raising awareness of current space research with the public. The team also plans to continue creating and releasing more of these waves recorded by other space missions. Dr Martin Archer has been selected for the European Geosciences Union Communicate Your Science Video Competition with an entry about SSFX. You can vote for it by liking the video on YouTube. We told you what sounds in space physically are, but did you know that Earth’s magnetosphere has a major role in controlling the sounds present around the Earth? It’s very much like a musical instrument, as Dr Martin Archer explains in our latest video delving into this complex magnetic symphony and some of the questions that researchers still have about it. Alien told us “in space no one can hear you scream”, which seems apt as we learned that sound can’t travel through space. Except it can, the entire SSFX project is about sound in space. So what is sound in space? The answers can be found in the first video of our SSFX series on the research currently being done into these space sounds.